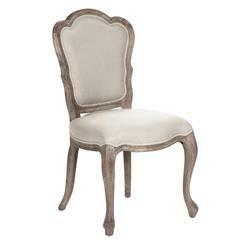 Stop looking – you just found the perfect, classic dining side chair! Designed in a goes-with-anything muted palette, the natural linen and grey antiqued limed wood that make up these beauties mean you can pair them with any décor, from traditional to modern home. The combo of the upholstered scalloped back and seat mean your guests will sit in cushy comfort.